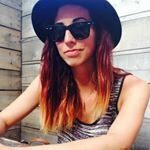 Help support Bushwick-based artist Daniele Frazier in creating a fun, shared experience for Brooklyn and Queens residents alike! Bushwick-based artist and Rear Storefront owner, Daniele Frazier, launched a Kickstarter campaign for the creation of the first public art piece in our very own Highland Park. 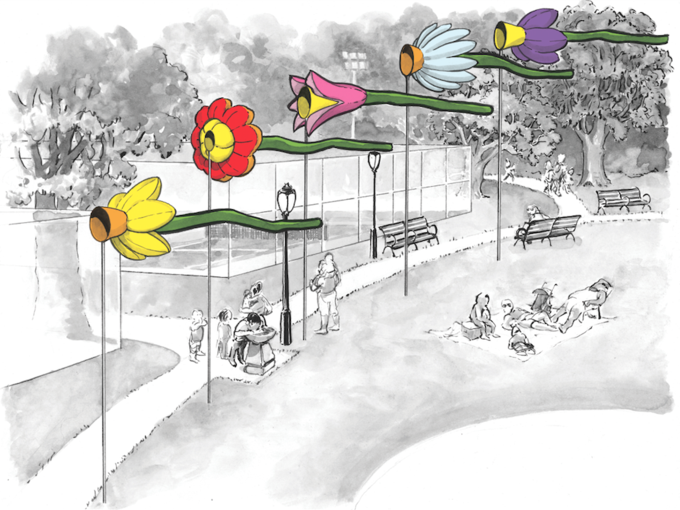 Titled "The Giant Flowers," the year-long installation will consist of giant, inflatable flowers that will both interact with the wind and serve as a captivating sight for parkgoers to enjoy. 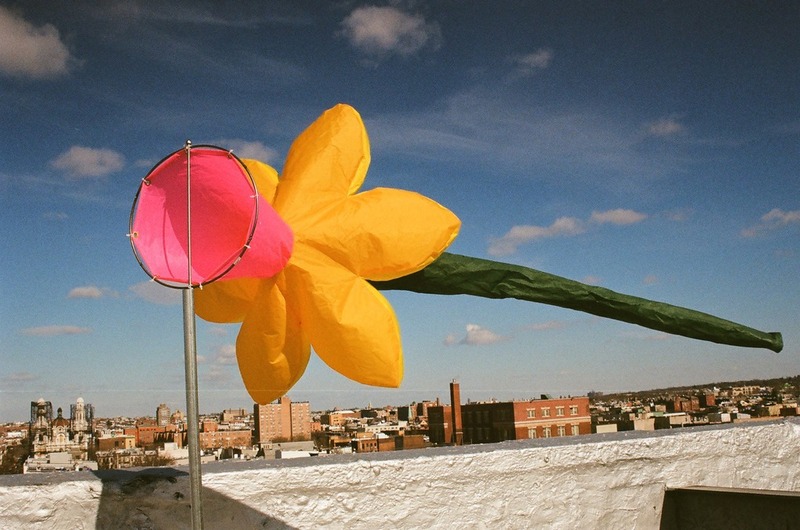 Frazier has recruited only the best manufacturers and even a professional parachute maker to ensure the safest, highest quality materials will be used for the installation of the twelve-feet long nylon flowers coming this June. Rendering of the completed project. Frazier chose Highland Park to showcase "The Giants Flowers" because it truly serves and engages both Brooklyn and Queens residents. The outdoor space hosts recreational sports, a children’s farm garden, a barbecue area and is also home to a gorgeous reservoir. Although it holds so many community events, Highland Park has never had any public art, so when the New York City Department of Parks and Recreation selected Frazier’s work, she was thrilled to contribute a fresh, collective experience for the neighborhoods surrounding the park. Although Frazier is a very multifaceted artist, she is no stranger to the use of inflatable elements within her large-scale textile works. 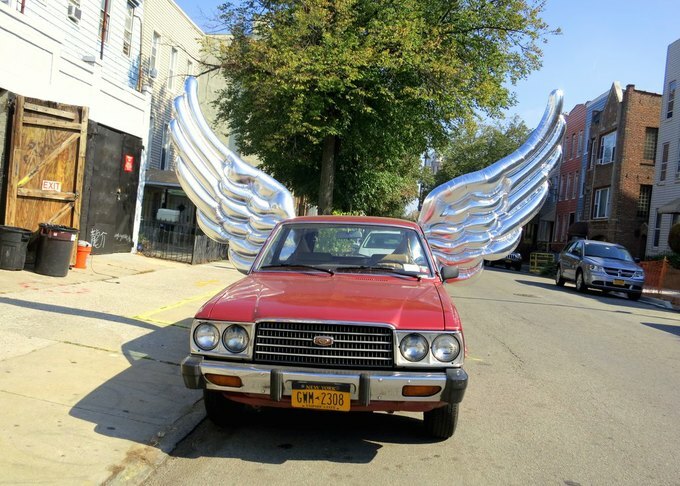 She once created a whimsical twenty-foot inflatable hammer and nail sculpture for the Queens-based Socrates Sculpture Park (titled "It Takes Two") and playful silver wings for her car. “Creating outdoor work is much different than a studio practice. There’s no guidebook for how to do something that’s never been done before. I enjoy the challenge each time in trying to make it work,” Frazier explains. She additionally makes beautiful soft kites, which are one of the fun reward options on Kickstarter! Frazier’s multicolored kites contain no sticks, so they almost create something sculptural in the sky as they communicate with the wind. 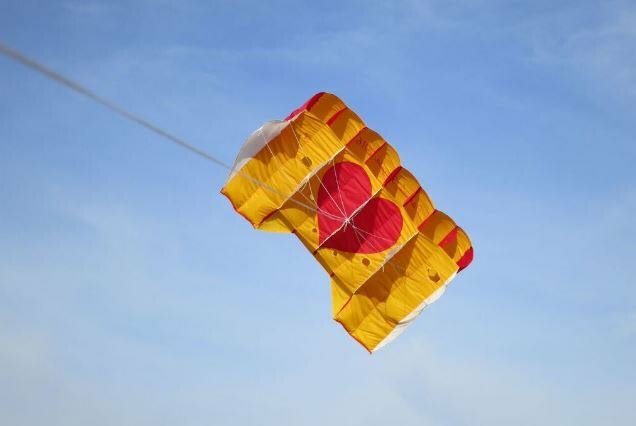 Frazier plans to incorporate a public programming element into "The Giants Flowers" and will host kite-flying days, along with kite-making workshops for the surrounding area. With the National Endowment for the Arts at risk, Frazier’s work has taken on more of a political stance and it seems more relevant than ever to support. She expresses why she chose to use Kickstarter as a platform for raising funds. “Since I launched this Kickstarter campaign, the federal budget may eliminate the NEA. Without federal arts funding, people will have to think of other ways to get public art out there. This campaign gives a chance for people to get involved and to say this is important—even if they don’t see the artwork in person. For neighborhoods that don’t have a lot of artwork— or any artwork at all—it’s important for them to have that opportunity. It’s important for kids to see art and for it to be surreal and happy; it’s such a gift. When kids see something, it sparks something in them,” Frazier explains. Rear Storefront, a studio space she shares with Trenton Duerksen, also matches that sentiment, providing an open-door casualness and neighborhood involvement for artistic endeavors. “It’s great when someone walks by and asks, ‘Hey! What are you working on?’ It’s been really fun to have this multi-use venue. I’ve lived in Bushwick for eight years, and after opening this space, I feel like I truly became a part of the community,” Frazier adds. Live off of Evergreen or brunching at Sunrise Sunset? Walk by Rear Storefront over the next few months to observe the creation of "The Giant Flowers" before its big installation. For more information and to check out her sweet campaign video, visit Frazier’s Kickstarter page. She is about $3,500 away from a goal of $10,000 with 15 days left to go! All images courtesy of Daniele Frazier.